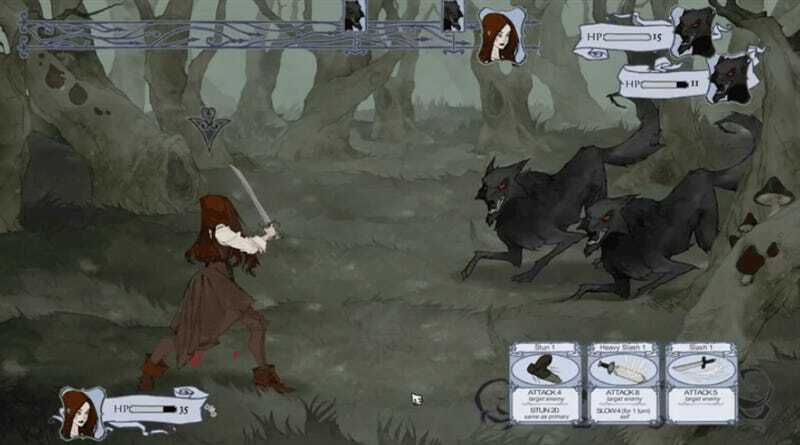 Would you believe this lovely hand-drawn collectible card-based role-playing game is based on the upcoming prequel/sequel to Snow White and the Huntsman? We don’t get movie tie-in games on PC and console much these days. It’s normally something cheap and derivative for mobile phones and tablets, little more than digital advertisements pasted over popular existing titles. When a movie game does come to more traditional platforms, it has to stand out. Well that certainly stands out. The game is the work of Desert Owl Games, the folks behind card-based strategy title Pox Nora. The studio’s most recent game, a science-fantasy turn-based strategy game called Void Rim, is currently on hold while they focus on other projects. Projects like licensed games that help pay the bills I’m guessing. The first episode (or book, as they call it) of The Huntsman: Winter’s Curse will be released for free on Steam for PC and Mac April 20. Subsequent episodes will be made available for a fee. Hopefully it plays as well as it looks. I’d love to get to a place where I start looking forward to PC and console movie games again, and not just because they’re hilariously horrid.